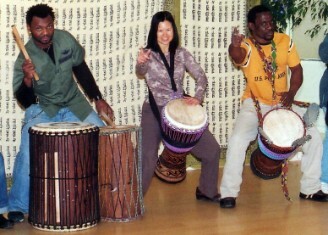 Abel and Francis exchange djembe solos. Boloye - This instrument consists of a calabash with an attached string that can be rhymically strummed while percussive beats are played on the round shell. Prince, Diane and Abel practice at the River School.